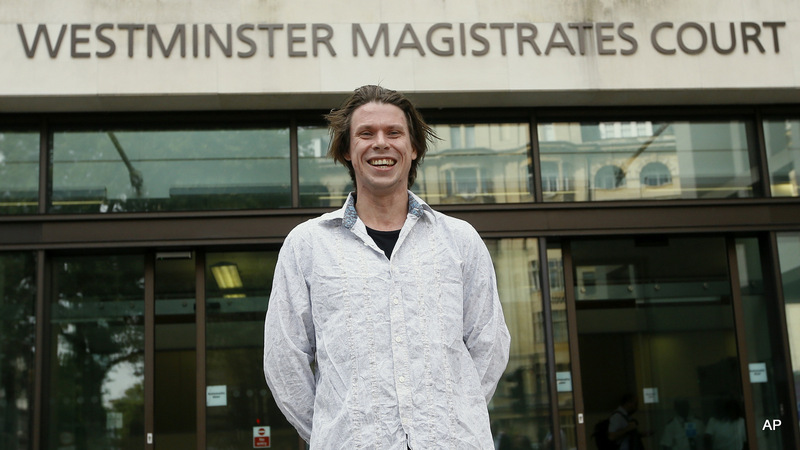 Lauri Love arrives at Westminster Magistrates court in London, Monday, July 25, 2016, where final extradition arguments took place for Love, accused of hacking into US government computer networks. 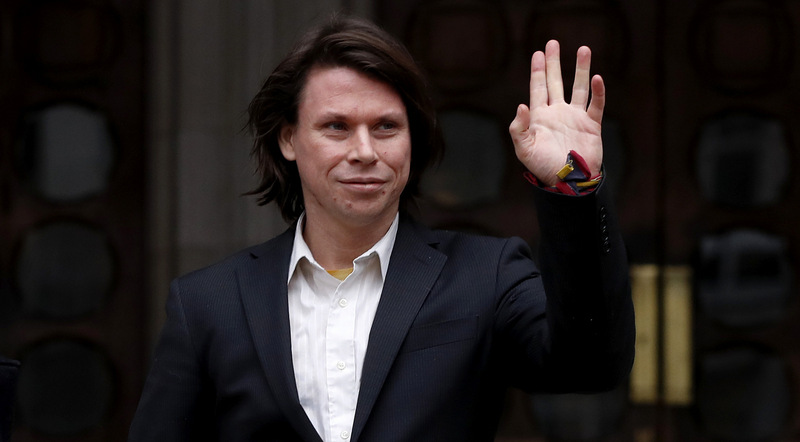 Update (Sept. 16, 2016): On Friday, a British judge granted a U.S. court’s request to extradite Lauri Love, the alleged British hacktivist, despite an outpouring of support from those who hoped he would be able to remain in England. Love, who is accused of taking part in a hacking operation associated with Anonymous, fears he’ll face treatment similar to that experienced by whistleblowers and hacktivists like Chelsea Manning or Jeremy Hammond. He has threatened to commit suicide if he is extradited. “I know that Lauri’s legal team will apply to appeal this ruling, and the Courage Foundation will continue to support Lauri until his safety is assured,” said Sarah Harrison, director of the Courage Foundation, an NGO that supports political prisoners like Love, Hammond and Manning, in a press release. AUSTIN, Texas — Lauri Love, an alleged British hacktivist, faces extradition to the U.S. over charges of supporting deceased programmer and activist Aaron Swartz. In an interview with MintPress News, Naomi Colvin, a U.K.-based campaigner for the Courage Foundation, which supports hacktivist and whistleblower political prisoners, says Love could suffer a similar fate to Swartz if he’s extradited. “There’s a blatant and rather unpleasant irony in that for allegedly protesting against the prosecutorial conduct and coercive plea bargaining that took place in Aaron Swartz’s case, he’s now facing exactly the same kind of treatment himself,” Colvin told us. Swartz, a well-known advocate for digital civil liberties, took his own life in January 2013 while facing up to 35 years in prison under the controversial Computer Fraud and Abuse Act, or CFAA. Swartz was charged for downloading academic studies from a paid scholarly journal website and releasing them to the public for free online. Love faces charges under the CFAA in three separate U.S. courts for hacks of government computers that made use of a widely-publicized security vulnerability in the web software ColdFusion. The hacks were part of #OpLastResort, a Swartz-inspired operation carried out by the hacktivist collective Anonymous. While simultaneously facing charges in three court systems is not illegal, Colvin said it was “unusual” and suggests “vindictiveness” on the part of the court system and its prosecutors, who were particular targets in #OpLastResort. Like Swartz, Love, who has been diagnosed with depression and autism, has threatened to take his own life if he’s extradited the U.S. to stand trial. Colvin said he’s understandably afraid of the treatment he faces in the U.S. prison system, unlike the U.K. with its emphasis on universal health care. “In the US it’s more about warehousing people, and it’s more about putting them in suicide watch and physically preventing them from harming themselves rather than treating them,” said Colvin. When it comes to the treatment Love would face in U.S. prisons and courts, Colvin also drew comparisons to other hacktivists that the Courage Foundation defends, such as Chelsea Manning, the military intelligence whistleblower who leaked thousands of documents that reveal military misconduct, and is facing indefinite solitary confinement after a recent suicide attempt. The U.S. has attempted to extradite accused U.K. computer criminals twice before, and the concept remains controversial in England, Colvin explained. Neither case, that of Richard O’Dwyer, accused of hosting copyrighted TV content on a popular pirate website, and another accused hacktivist, Gary McKinnon, resulted in successful extradition to the U.S. In many other cases, U.K. hackers accused of breaching U.S. computers have been successfully tried in British courts. Manning is far from the only whistleblower or hacktivist to face the wrath of the U.S. prison-industrial complex. Jeremy Hammond, the Anonymous hacktivist who leaked millions of emails from Strategic Forecasting, a private corporate intelligence agency based in Austin, Texas, to WikiLeaks, has also suffered in solitary confinement, while Barrett Brown, a journalist imprisoned over his ties to Anonymous, has also been repeatedly targeted for punishment, especially after exposing corruption within the Bureau of Prisons. “I think Lauri can count on a great deal of public support in the United Kingdom,” Colvin said, who also hopes Love’s case will encourage Americans to renew stalled efforts to reform or repeal the CFAA. A decision on Love’s extradition is expected September 16.